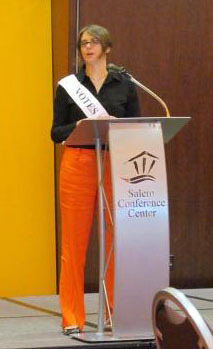 The 2012 Oregon Heritage Conference “Fertile Ground: Planting the Seeds for Restoration, Innovation and Collaboration” opened Friday’s session with a warm welcome from Salem Mayor Anna Peterson proudly wearing her Votes for Women sash. Salem’s City Council, it should be noted, has an equal number of female and male councilors in addition to Mayor Peterson. 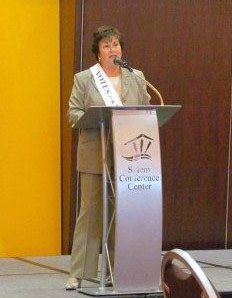 Eliza Canty-Jones offered a lively and informative State of the Suffrage Centennial for Plenary session. Canty-Jones presented a concise history of how plans for the centennial began in 2008 with a survey that showed high interest in a woman suffrage centennial commemoration, but no organization or institution had any plans in the works. 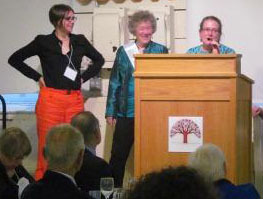 From that initial review the core group of centennial advocates, Kimberly Jensen, Janice Dilg, and Canty-Jones determined to form a new 501 c 3 organization, the Oregon Women’s History Consortium. The Century of Action: Oregon Women Vote, 1912-2012 became the OWHC’s first project. With grants from the Oregon Heritage Commission, Oregon Humanites, and donations from many individuals the OWHC has mounted the state’s only comprehensive suffrage exhibit at the Multnomah County Library. Panels from the exhibit will soon be available for free to download for any organization, school, library, or museum anywhere in the state. The OHC grant will also fund several presentations of the Century of Action’s Town Hall debate around the state. For her leadership as Chair of the Oregon Heritage Commission, and her support of the suffrage centennial Jan Mitchell was sashed at the annual Oregon Heritage Excellence Awards Friday evening. Need a sash for yourself or someone who appreciates voting rights for women? You can order one here.